Many people believe that bed bugs can’t be seen by the human eye, but this is not true. While they are small, adults can be seen, growing to be about 1/4 inch in length. Bed bugs are wingless parasites that are flat and oval; adults are reddish-brown, although they do become a deeper red directly after feeding. While the adults can be seen, their whitish colored eggs are almost impossible to see with the human eye, and their newly hatched nymphs are no bigger than a pinhead. In the case of a very large infestation, they create a distinctive unpleasant odor inside homes and other properties. Bed bugs are found hiding and living in places mainly where people (their main food source) are also present. They cannot fly or jump so they rely on hitchhiking to move themselves from new location to new location. They are commonly found invading places like used furniture and clothing stores, airports, bus stations, libraries, hotels, motels, shopping centers, dormitories, movie theaters, and other public places. During the day the bed bug’s flat body allows them to hide inside cracks and crevices that are found in wooden furniture, walls, box springs, mattresses, baseboards, light switches, windows and picture frames. They are efficient crawlers and come out at night from their daytime hiding spots to feed. Bed bugs are parasitic pests that feed on blood. Humans are their preferred food source, but in a pinch they will feed on any warm-blooded animal. If no food sources are available and the adults are already well fed they can survive for approximately 6-7 months until they find a new host. They can also enter a state of semi-hibernation when the temperature fall below 61°F that can last for months. A bed bug infestation can happen to any home at any time. They don’t care about cleanliness or clutter in the place they are living in; all they care about is that there is food present (you and your family). The following tips can help to prevent a bed bug infestation in your home. When spending time at a hotel or motel while traveling inspect your accommodations for signs of bed bugs; and if you have any suspicions ask for a new room. After returning home from a trip, immediately wash clothing in hot water, vacuum, and clean out all suitcases and travel bags. Put purses and bags in your lap rather than placing on the floors in public places. If possible, do not purchase and bring into your home used furniture, mattresses, and box spring. When purchasing new or used clothing, immediately wash the items in hot water. At the first signs of bed bug activity in your home contact a professional bed bug control expert. When it comes to getting rid of bed bugs, the bed bug control professionals at Quik-Kill Pest Eliminators are ready to help. 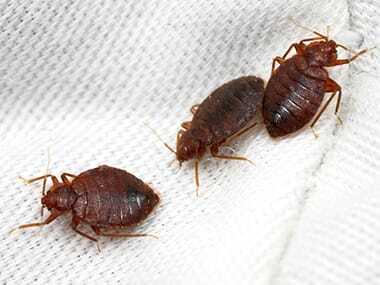 We offer a variety of bed bug treatment options including conventional methods and highly effective heat treatments. For the accurate identification, treatment and prevention of bed bugs in your home or office, please contact Quik-Kill today!